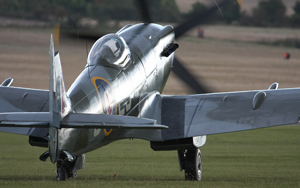 Duxford’s autumn airshow has long been the finale to the UK’s air display season. This year was no different. For weeks before on various forums people had been complaining about the line-up for the final show. I felt that whilst participation was a bit thin, what was on offer was a nice mix of war bird, jets and helicopter action. Military assets were also on display with the Autumn show being the final ever solo display of the Hawk T.1. 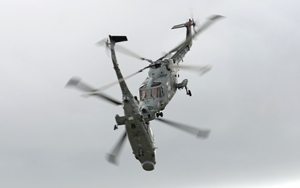 It was also to be the final display of the Royal Navy Black Cat Lynx team. Next year will see a solo Lynx on the circuit as the helicopter is phased out with the new Wildcat replacing it. 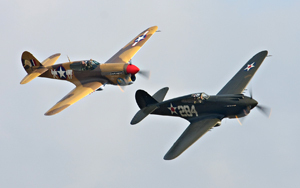 Duxford’s air shows usually have a theme or a celebration. 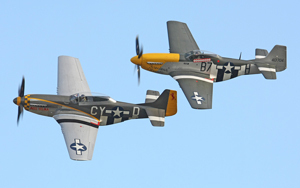 This year it was the turn of the ‘Cadillac of the sky’, the P-51 Mustang. With around 7 P-51’s flying in the UK, I half expected to see most of them at Duxford for the 70th anniversary. Unfortunately there were only 2, which were both Duxford based machines. Having said that their display was an absolute cracker, but more of that latter. Once again, blue skies graced us at Duxford, at least up until the airshow started. Once the sun hid behind the clouds, it got a bit nippy (and very difficult for photography!!!). This did not blight the display in anyway though. 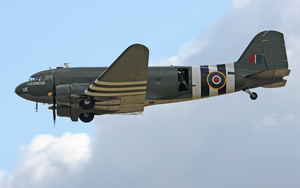 It was nice to see the Battle Of Britain Memorial Flight’s DC-3 Dakota opening the show. This was the first of the RAF’s aircraft to display that day. Following this was Pete Kynsey in his amazing LeVier Cosmic Wind. The aircraft was designed and built by Lockheed’s Chief test pilot Tony LeVier in the late 40’s. 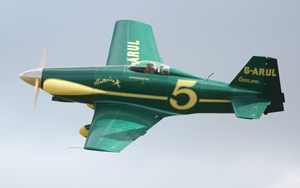 Using an 85HP continental engine, it was designed to compete in the Goodyear air racing trophy. The aircraft is absolutely tiny and seemed to get almost lost whilst displaying. The Royal Navy Black cats have displayed at air shows across the UK since 2001. Using the Lynx helicopter in a pairs team, they have wowed airshow goers . The display was as usual , a very high standard with crossovers and formation work. This was only the second time this year that the team have used both ‘Special Painted’ Helicopters. It was however their final time as a pair as next year the team switch to a solo Lynx. Who knows, will we see a pair of Wildcat’s in the next few years?? From modern day helicopters, we then took a step back to a pair of Fournier RF4D motorised gliders. The ‘Red Hawks’ performed some great, tight formation aerobatics with some lovely close passes too. Amazing for a pair of aircraft that pump out around 80HP between them!! 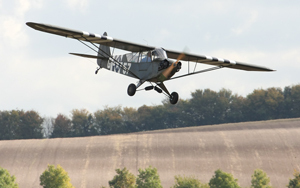 Three WW2 American aircraft took to the sky next, Frazerblades Piper L-4 Grasshopper, The golden apple operation’s Boeing Stearman and TFC’s Harvard. The display seemed a little muddled to me, I wasn’t sure which one to watch!!! The RAF’s training Squadron’s came to Duxford with their Hawk T.1 advanced jet trainer and the Tucano (basic Jet trainer). As a one off, and never done before, The pair of trainers flew together in a couple of formation passes. 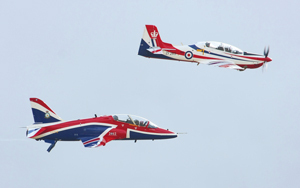 This will not be seen again as the RAF are phasing out the Hawk T.1, as the new T.2 is brought into service. Flt LT Jon Bond and Flt LT Phil Bird did a nice job of bringing the pair together for the cameras. After splitting, ‘Bondy’ bought the Tucano back in for his solo. Jon will be posted to 4(R) Sqn at RAF Valley to complete Tactical Weapons Training on the Hawk T2, before progressing to a front-line squadron. 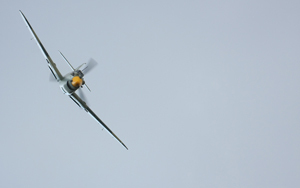 Flt LT Bird then came in with an amazing final display in the Hawk T.1, a very fitting end to the T.1 solo display. 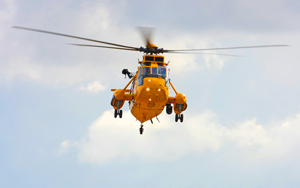 The RAF’s final display of the day was by a Sea King HAR3 from Wattisham. It was a great demonstration of a rescue as the team picked up a ‘downed airman’ from the runway. 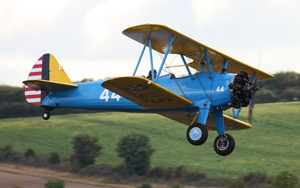 From Big yellow helicopter we then moved on to a pair of small biplanes. 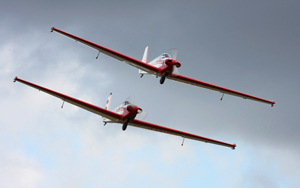 The TRIG Pitts duo team are into their second season flying the diminutive Pitts S-1D. 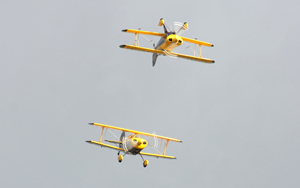 Pilots Richard Grace and Dave Pulston flew an outstanding display with plenty of formation passes and crossovers. 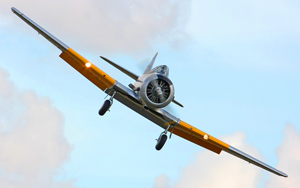 This was followed by Tom Cassells in another famous Aerobatic aircraft, the Cap 232. The war bird fanatics were treated to a tail chase by Carolyn Grace’s 2 seat Spitfire IXT ML407 and Historic Flying’s Hispano Buchon. 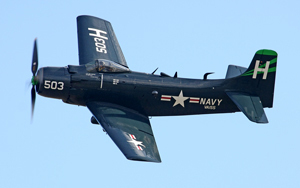 This in turn was followed by Kennet Aviation’s Skyraider. Stephen Grey had to bring his display to a quick end in TFC’s MK XIV Spitfire which then brought in the Curtiss Warhawk pair also owned by TFC. 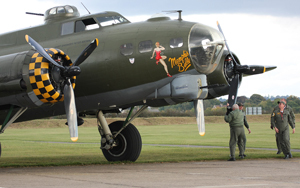 Resident B-17 Sally B made her final appearance of the year with another evocative display. At the end TFC’s TF-51 Miss Velma tried to catch her up for a formation pass, it didn’t quite work out for us at the M11 end. It would be nice to see a few more ‘Little Friends’ passes next season. After Sally B had touched down, Miss Velma joined up with OFMC’s P-51 for a tribute to the Mighty Mustang. Brian Smith led Alistair Kay in TFC’s Mustang in what was an absolutely breathtaking formation display. This was one of my highlights of the airshow. I think the biggest highlight for most people, myself included was the next pair. Miss Demeanour….. What can I say, who can fail to not be impressed by the stunning paintjob. Couple that with the amazingly talented Jonathon ‘Flapjack’ Whalley and you know your in for a treat. Jonathon flew his Hawker Hunter (Miss Demeanour) with OFMCs P-51 mustang in a unique formation in front of the Duxford crowd. With a couple of formation passes before taking centre stage to close the 2012 Airshow season. As ever his display was a delight and it was nice to get the unique Hunter ‘Blue Note’ too. Great job Jonathon. He even took the time after landing to sign my 8yr old son’s souvenir programme…….A big thanks!!! Looking back on the day, although the display itinery looked a bit thin, the Duxford team had brought together something for everyone. Be it Military or Civil, Warbird or Helicopter, Aerobatics or training aircraft, Duxfords Autumn airshow had a little bit of everything. With the 2012 airshow season over we now look to Nightshoots. Can you imagine if Duxford ran one of them!! !